One of an employer's greatest challenges is staffing their organization with people who are prepared and motivated to work. In some fields, poor work ethic has reached epidemic proportions, contributing to wasteful inefficiency and high rates of employee turnover. 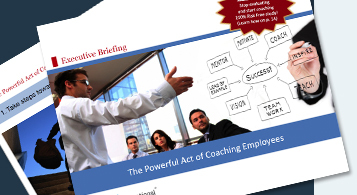 Learn how to coach your employees. Canada's Most Productive Companies do more with fewer people. It starts at the top with a clear strategy that cascades into a properly designed organization with jobs that execute the strategy efficiently. All jobs have clear descriptions and goals so that everyone knows exactly what needs to get done and how. This ensures, for example, that three people are never doing the work of two. are observed at the organizational level." Canada's Most Productive Companies closely monitor and benchmark personnel expenses. They review requests to create new jobs with intense scrutiny and a healthy level of skepticism. They expect people to arrive at work a little earlier and leave a little later, and they reassess priorities to determine what work is most important and what activities can be streamlined because they don't add sufficient value. In a traditional sense, they are more open to investing in technology and training if it reduces and/or slows the growth of headcount. Since many of these organizations run so lean, they are usually more flexible than their peers in handling special circumstances such as special projects, peak demand periods, and unplanned employee absences. Full-time employees are cross-trained to cover for one another in times of short-term need. The Most Productive Companies cultivate good sources of contract and temporary labour and have proven practices to ensure they deliver on what is expected. Overall these companies use superior talent management practices so that they can easily identify a potential need for additional people. And they have efficient selection and onboarding practices so that new people become productive in a shorter amount of time. PROFILES STEP ONE SURVEY® II Canadian is a pre-employment assessment for identifying people worthy of consideration by evaluating four essential areas of qualification, including work ethic. Using PROFILES STEP ONE SURVEY® II Canadian ensures that you hire more hard-working people. Running lean is not the only thing a company must do in order to run well. Goals must be achieved at the employee level so that results are observed at the organizational level. In the Most Productive Companies, strategic objectives and goals are clearly defined at all levels of the company and performance measures are closely aligned with strategy. As a result, employees focus on the aspects of their jobs that matter most to the organization. Additionally, the Most Productive Companies keep always before them a clear picture of the type of employee who has the best chance of succeeding in the role. They consider an employee's fit with the job, the team, and even the manager. And they use the characteristics displayed by high-performing employees in each role as a model for prospective hires. Although critically important, "fit" alone is not sufficient to ensure that an employee will be effective in a job -- experience and skills also factor largely into the formula. The Most Productive Companies are more likely than their peers to identify the particular experience and skills needed for success and then provide specific training to help employees close the ability gap. The PROFILES XT® is the best job-fit tool you can use to match people with the work they do. It measures the essential factors that mark the difference between success and failure in specific jobs. PROFILES XT® helps organizations put the right people into all the positions throughout the organization, allowing employees to utilize their talents without limitations.